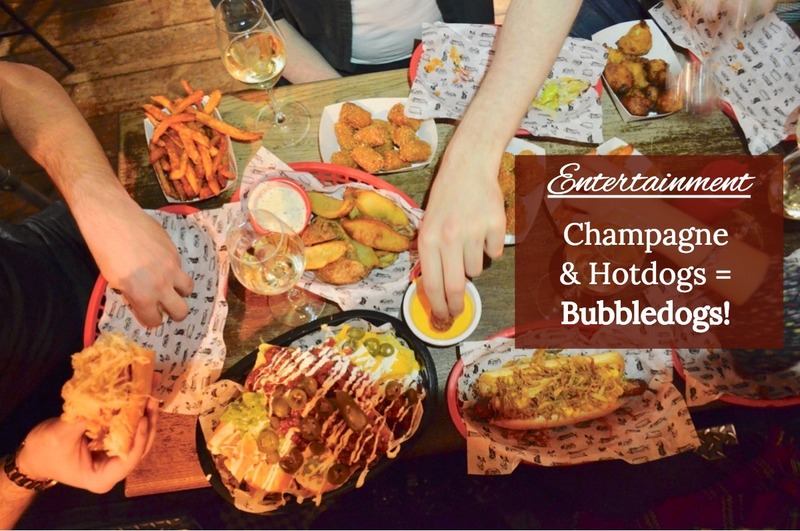 As a major foodie and lover of all things fancy, you can just imagine my sheer delight when someone told be about Bubbledogs – a little place in London whose menu is centred solely around champagne and hotdogs – whaaaattttt?! 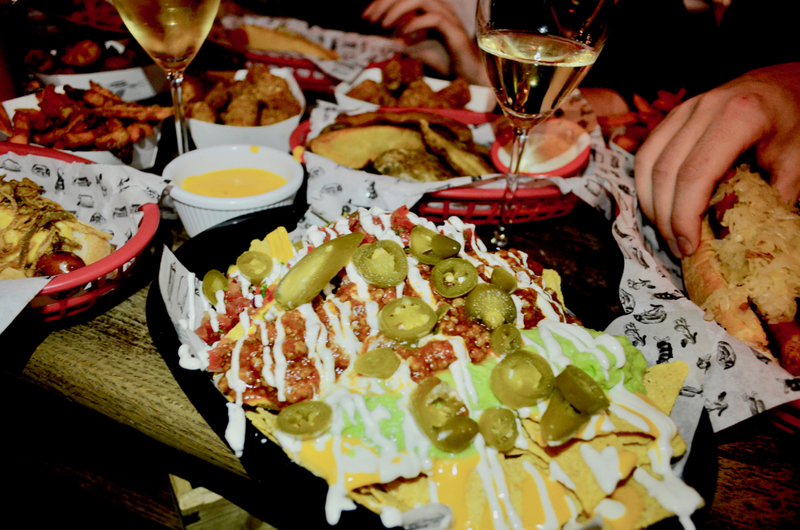 I was convinced that a place that has a six page champagne menu would definitely overcharge on food but I was really pleasantly surprised. 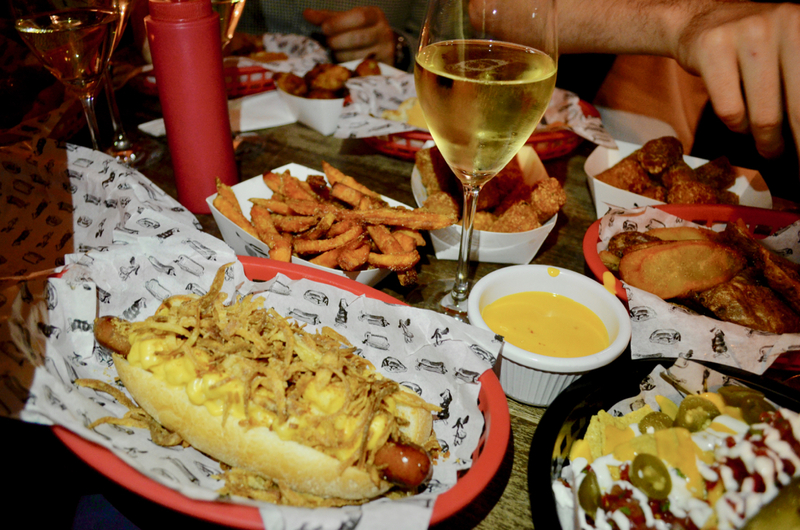 Hotdogs average just £8 and glasses of champagne start at as little as £6.50. Bottles start at £35 and go up to £135 so you can pinch the pennies or splash the cash if you’re treating someone, the choice is yours. In case you were wondering they do also serve cocktails, beer and there are a couple of non-alcoholic beverages for those of you who aren’t partial to a bit of bubbly. 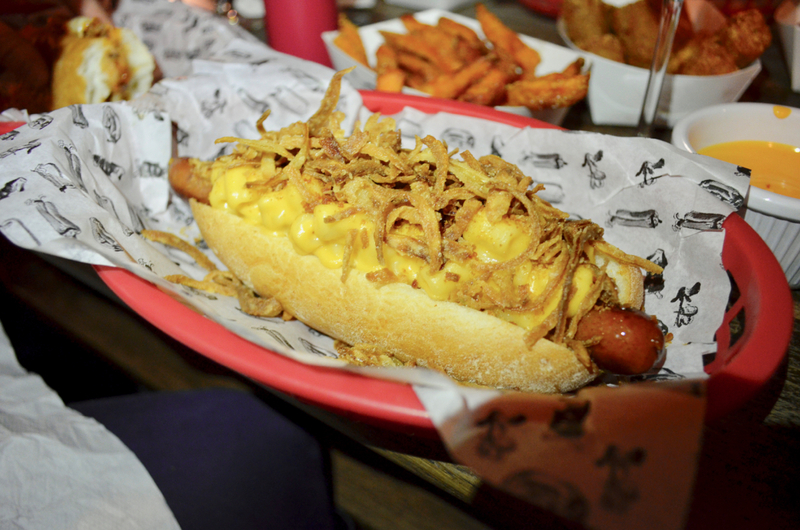 I’m a sucker for macaroni cheese so I went for the Mac Daddy hotdog which is topped with lashings of creamy macaroni cheese, crispy onions and bacon bits. It was the bomb dot com. We also shared a bunch of sides as you can see above, all of which I thought were good. Satisfyingly stodgy but not too greasy. 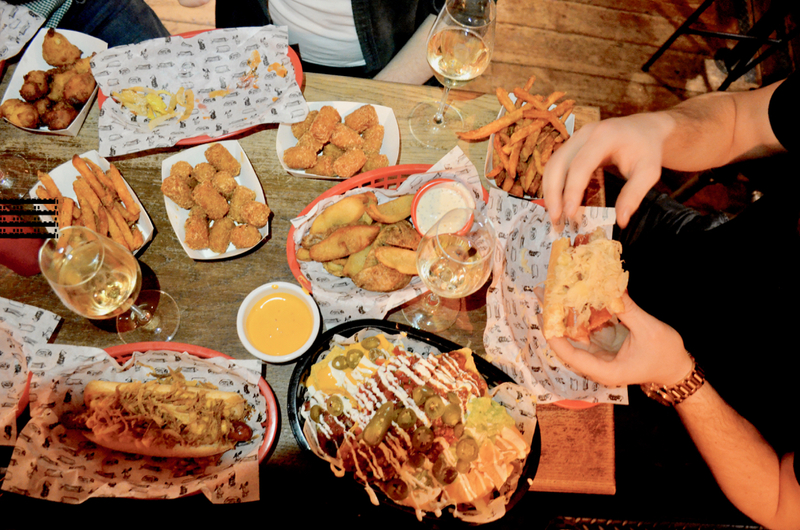 The atmosphere in Bubbledogs is really good as well – a key part of any dining experience. The place is small so I didn’t manage to get any subtle shots of the room but the decor is all wooden beams and low ceilings. Although we didn’t book, our group of six still managed to get a table after a short wait and the staff were friendly and accommodating. The dress code is casual, at the time we went on a Friday night it seems to be full of groups doing exactly what we were doing, catching up with friends as a nice way to start the weekend. 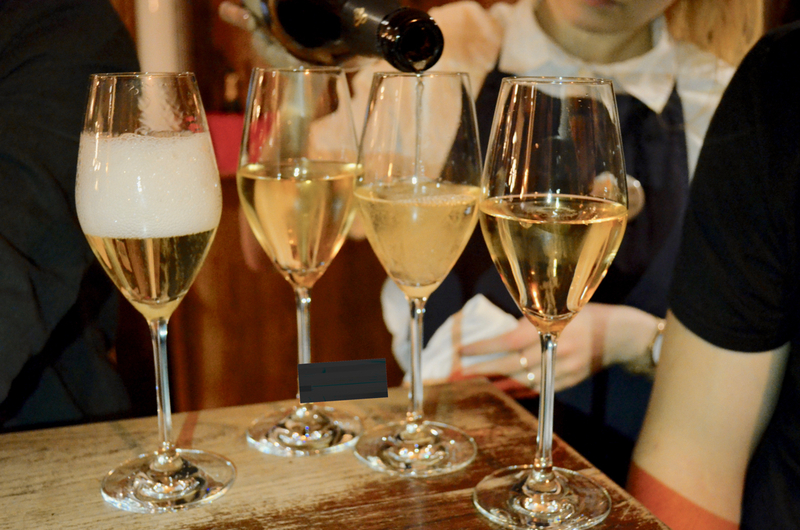 Tonight I’m off to Polpo in Soho for arancini (my absolute fave) and prosecco. 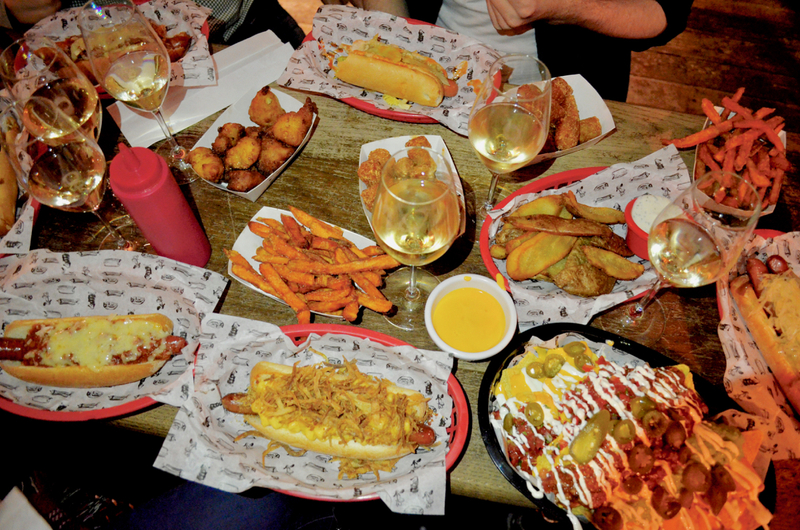 If it’s good, I’ll save it in my Facebook ‘Great Places to Eat’ album so you can add it to your lists! Instagram: For Insta stories sneak peaks and more unseen photos! Pinterest: Where I pin all the cool ‘luxe for less’ things I think we should buy! Facebook: For all the ugly outtake photos from my blog shoots haha, it’s fun to laugh at yourself!